The FA have recently issued a ruling to ensure consistency of application across the whole country. Essentially the age group that a player joins is determined by his or her date of birth – this also mirrors the school year. 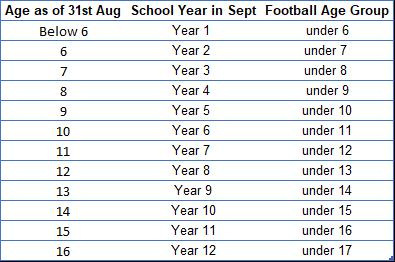 The key date is 31st August and the chart above shows which age group applies for the current season. FA rules do permit a child to “Play Up” a year (an under 9 can play for under 10’s) but under no circumstances can a child play for the age group below. As a club, Stonesfield Strikers require that, for any player wishing to play up a year, a consensus of agreement is reached between both age group managers, the child's parents and, of course the child themselves. We always try to consider what is best for the child, taking into account factors such as ability and physical development.